The keystone message of the medical industry, to eat more vegetables, can be difficult to swallow, but this is one area where you should redouble your nutrition efforts. Why? Eating more vegetables usually result in a slimmer, stronger figure, a lower risk of chronic disease, and a longer life. It’s true that produce is a powerhouse of important nutrients like Vitamins A and C, calcium, and iron, but here are some additional reasons to keep reaching for the crisper. Texture is an easily forgotten aspect of the eating experience, trumped constantly by aroma and flavor, and yet it plays a key role in the snacks that wreak so much havoc on our waistlines. Food companies are keenly aware that when you’ve got a craving, the odds are that you’ll reach for something crisp. Crisp foods make for great mindless eating, a hazard for those trying to watch their weight. Fortunately there are some excellent crisp vegetables to take the place of processed snacks. Baby carrots or those sliced on an angle can make a great replacement for chips when paired with hummus. Mini bell peppers make a great, nutrient dense finger food at only about 90 calories a pound. For creamy food lovers, cooked cauliflower can be incorporate into a dip for a tasty, healthy twist. Peas, cooked, masked and mixed with avocado, can make for a low calorie guacamole. The term ‘antioxidant’ snuck into our food vocabulary so gradually that many people are still unsure of exactly what it means. Here’s a brief low-down: our body is constantly exposed to harmful stressors in the form of UV sunlight, smog or smoke, and even the blackened surface of grilled foods. These evildoers cause oxidation in the body (like human rust) that increases the likelihood of arthritis, heart disease, and cancer. Antioxidants are chemicals formed naturally in many plants such as soybeans, sprouts, beats, and onions and are the body’s first line of defense against such diseases. As a bonus, cruciferous vegetables (broccoli, Brussels sprouts, and cabbage) have a whole additional class of health promoters called isothiocyanates that have been shown to very drastically reduce cancer risk when eaten regularly. Weight loss gurus are well aware that adding fiber-rich foods to the diet can increase fullness after a meal, resulting in easier weight loss. 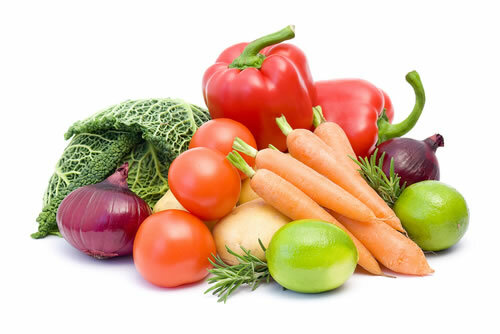 Vegetables are a great source of both important types of fiber: soluble and insoluble. Soluble fiber, while not filling, is important for gastrointestinal and heart health. Insoluble fiber is very filling and promotes digestive regularity. Both types promote health and weight loss, but on top of that the vitamins and minerals can fight hunger in a surprising way. Many of the nutrients we need each day go toward cognitive functions like concentration and sharp-mindedness. By eating vegetables that keep a clear, focused head can help reduce mindless eating and fight temptations. That’s right, vegetables have a great shelf life. Frozen and canned vegetables have lasting power and retain many of their original nutrients. Frozen vegetables in particular are picked and frozen at the peak of freshness, meaning that they may have better flavor and health qualities than even their fresh equivalents. Pre-made frozen vegetables dishes, like those at Trader Joes, are quick and easy entrées on a busy day. With advances in food production vegetables have even taken a leap onto your snack shelves. Puffed vegetables (ignore corn products) and other vegetable snacks can be worth your while as long as the sodium stays low. Much like texture, visual stimulation is a powerful driver in eating behavior. Why consume controversial artificially colored foods when bright beautiful hues are available naturally in the garden? Keeping attractive bright vegetables around the house can encourage healthy eating behaviors. When storing vegetables, keep them at eye-level in your refrigerator, instead of in a drawer, as a reminder of your nutrition goals. Disposing of forgotten and spoiled vegetables hidden in the crisper is just one more deterrent to a healthier lifestyle. On food, colorful vegetable salsa can improve the appeal of a healthy baked fish or chicken dish. Yes, texture and color are under-appreciated but where would we be without flavor? The heat of peppers, the pungency of onions, the bitterness of greens and the sweetness of tomatoes make for a rich palette of flavors far beyond that of the fatty, salty foods that weigh down the western diet. Incorporating more of these dynamic, rich vegetables into the diet can actually change your taste preferences so that less healthy foods begin to taste bland! Changes in tastes like this take time, but are well worth the commitment. Simply reducing calories can make an impact on temporary weight loss, but adding vegetables can create lifetime habits that result in lasting health.